Solar energy has emerged onto the scene in recent years as a simple form of natural power that is not only sustainable but incredibly long-lasting. If you’re currently in the market for the best solar generator or are simply considering your options, you have most certainly come to the right place. We put together the following detailed reviews of the best solar generator on the market today, along with a helpful buyer’s guide for your shopping ease. The first pick on our list for the best solar generator is this Portable Power Station by Goal Zero. It is so powerful that you can charge as many as 10 devices at one time with its 1425Wh capacity. Charge everything from your blender and TV to phone and tablets with the Goal Zero Yeti 1400. The great thing about the Goal Zero Yeti 1400 is the fact that it operates on lithium power, which has an extended battery life, is more compact, and offers a wider range of usage options than typical generator varieties. We like the lightweight design of the Yeti 1400, featuring helpful handles to make it even easier to navigate from place to place. The solar generator also includes multiple, flexible outlet options to charge any device you please. The LCD display makes it easy to adjust your generator, although we found that the screen lights aren’t very bright. If you want to charge the battery, you can connect it to a 120V outlet. You can also use your car as a charging device. Otherwise, you can use the solar charge control. If you opt for this option, you will need to purchase solar panels in addition to the unit. The 1425-watt power of the solar generator offers an astounding 118 hours of charge for USB powered devices. You can even charge a laptop from 0% up to 16 times and run a LED light for days on end. There’s also an expansion port beneath the lid if you need more power and decide to link more than one Yeti 1400 together. The next solar generator on our list weighs just 12.57 pounds and sports a 440-wattage capacity. The unit is best for charging smaller devices from mini refrigerators to tablets and laptops. The Jackery Explorer 440 is not only small and highly portable but incredibly easy to use. You can take it out of the box and use it right away without having to waste time on assembly, which is a huge plus in our book. To power the Jackery Explorer 440 up, all you need to do is connect it to a compatible solar panel to reach a complete charge in 10 hours. If you want a shorter charging time, simply connect it to a wall charger and it will be all powered up in around 8 hours. We like how flexible the Jackery Explorer 440 is because you can use it for a wide range of appliances and devices. With three USBs, one car outlet, two DC outlets, and one AC outlet, you can keep all your essential units powered up for extensive periods. The LED display is also helpful, letting you check on your battery power to make sure the levels are sufficiently charged. One downside of the Explorer 440 is its lower wattage levels. So, if you’re looking for a higher watt-hour capacity, this selection might fall short. However, the lithium battery has a 20.4-amp hour charge with a 300-watt inverter and 500 surge wattage which we feel helps make up for that fact. We would say that the Jackery Explorer is better for shorter outdoor activities or power outages, rather than extended ones. For portable solar power on the go, look no further than the Renogy Phoenix Portable Generator. If you want an emergency backup power source, the 16Ah battery and 20W monocrystalline solar panels are a strong contender. The Renogy Phoenix definitely stands in a class of its own and is no larger than a briefcase. The solar generator looks just like a portable briefcase, weighing less than 13 pounds if closed. It is a perfect choice for emergency power on the go, featuring 10W solar panels to charge under the sun. It also sports a large handle for easy carrying. We like how user-friendly the Renogy Phoenix is, with one power switch that turns on the unit and individual control to set DC or AC currents as needed. You can view the display at the top to assess the progress of the device’s battery charge and how strong the sun’s rays charging the battery are at any given point. The Phoenix also features a wide selection of outlets to meet a range of user needs, with input ports you can use to hook up to extra solar panels. The battery has an approximate 1500 charge cycle life. One point we noticed is that the unit takes a bit longer to charge than some other products on the market, taking around 15 hours to reach a full charge through solar energy. The next generator on our list offers a peak 150W AC output with a wide range of power options to suit an array of user needs. You can power everything from car devices to laptops, plus this solar generator has 3 different charging options to pick from. The Paxcess 100-watt Portable Solar Generator offers a 155-watt-hour storage capacity. It functions as a power station that you can easily transport from place to place. It is so light at only 3.3 pounds, that you can bring it on the go with you just about anywhere. This solar generator sports an impressive 40,800mAh lithium-ion battery with 100-watt pure sine wave inverter, so you can keep AC appliances as high as 100W going with ease. The solar generator is also an excellent choice to charge devices like cameras, laptops, phones, and tablets. We especially like this solar generator’s various output ports. From dual AC sockets to multiple USB ports, three DC ports, and a cigarette lighter charger, you’ll have just about any outlet you could need for any situation. The Paxcess 100-Watt Portable Solar Generator is perfect for camping and long trips, on-grid or off-grid for smaller devices and appliances. One thing to bear in mind is that the Paxcess generator is not designed for large appliances and high-power needs. Its small size and capabilities are better for the short-term, not large-scale emergency situations. The quiet solar generator by EF Ecoflow weighs only 11 pounds but sports a 412-watt-hour capacity, making it an ideal choice to charge smaller devices in emergency situations. If you think it’s impossible to charge 11 different devices at the same time, EF Ecoflow’s River Portable Power Station makes it a reality. Once you fully charge the River Portable Power Station, it will keep a positive charge for as long as an entire year! So, you can keep your mini fridge charged for over 10 hours and charge your mobile device 30 times or more. Pretty amazing! You can use all 11 outlets at the same time, so any smaller appliance or device of your choice will stay fueled for however long you need it to. The River Portable Power Station is a great choice for everything from camping trips to emergency scenarios. What’s more, charging the River Portable solar generator is nothing short of a breeze. It takes about 6 hours to reach a full charge with a wall device, 9 hours with a car charger, and anywhere from 10 to 15 hours if you choose to use solar energy. We also like the fact that the solar generator comes with an IP63 certified case that is resistant to shocks, dust, and water. The River Portable generator will not only stand the test of time but is a worthy investment to keep all your smaller devices powered for longer periods. If you want a power station with an extra kick, this next solar generator might be the choice for you. With a 60,000 mAh high capacity, you can charge devices like tablets, laptops, drones, and mini-fridges over and over again without losing a positive charge. The lightweight, easy to maneuver specs of this generator by SUAOKI it an easy win if you’re looking for high octane power in a small station. You can keep it in your closet, your car, or carry it with you on a camping trip without feeling weighed down. We especially like the 60,000 mAh capacity, making this product one of the most powerful on the market currently. You can power a wide range of small appliances with SUAOKI’s solar generator, including TVs, laptops, computers, and mobile devices. With two 110V outlets, 2 DC outlets, and 2 USB outlets, you can charge just about any small device you please without losing a positive charge. The pure sine wave capacity safeguards your devices from being damaged from overcharge too. You can charge the generator with a wall outlet or by using a solar panel. We feel one downside is that there is no solar panel actually included. So, if you want to charge the device, you’ll need to make a separate purchase. The SUAOKI generator sports over voltage, over temperature, and over current protection, to keep you safe and secure whenever you operate the unit. It also features an aluminum covering to protect it from the elements, dents, and scratches. Now that you’ve gotten to know some of the top solar generators on the market, we’d like to walk you through the essential facts you need to know before making your purchase. Next, we’ll offer you some considerations to think over so you can choose the solar generator that is best for you. Whether you experience frequent power outages or are on the road often, a solar generator could be the perfect solution to keep all your essential devices charged when you need them. Unlike other types of generators, a solar generator doesn’t need fossil fuel and can help you stay powered totally off-grid. In simple terms, a solar generator is an electronic device containing an inverter, a charge controller, and batteries. The generator is powered by the sun, harnessing that energy through solar panels and transmitting it into the battery. The inverter then emits the energy to power a wide range of devices, such as refrigerators, smartphones, lights, and laptops. If you are concerned about the impact of standard generators on the environment, the good news is that solar generators don’t emit toxic elements like petrol or diesel. So, how does a solar generator work? We’re glad you asked! We’ve already discussed the 3 primary elements of a solar generator—the battery, the charge controller, and the inverter. The battery stores the energy taken from the sun. Lithium-ion batteries are the kind that solar generators usually use, but some are also compatible with lead-acid batteries. 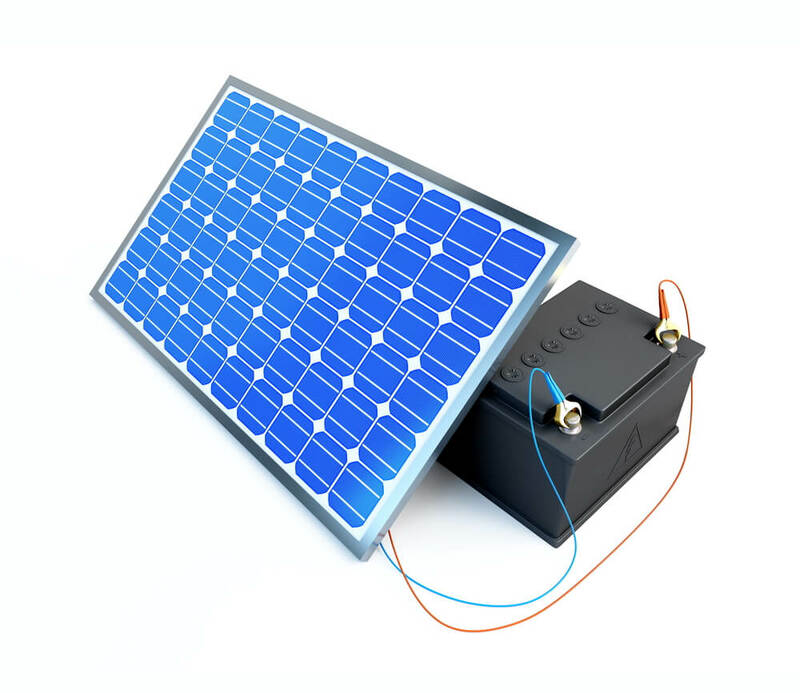 The charge controller serves to safeguard and enhance the longevity of the battery of your solar generator. Different charge controllers will have various features to charge and discharge your solar generator’s battery based on the kind of battery powering the unit. Finally, we have the inverter. The job of the inverter is to switch the low DC or Direct Current power in the battery to AC or Alternating Current power. Once the power converts to an Alternating Current, you can charge AC units in your house. DC devices simply skip the inverter altogether because the charge does not require conversion. To sum things up, the solar generator takes energy from the sun through solar panels, keeps it in the battery contained within, then converts the DC energy to AC energy so you can charge everything from mobile devices to household appliances. If you’re stuck between a solar vs. a fuel generator, we’re here to help dissect the differences and make the decision process easier. You already know how a solar generator works as detailed in the section above. There are numerous benefits to using a solar generator besides its obvious effects (or lack thereof) on the environment. Besides, being eco-friendly, solar generators are an excellent choice because they lack any moving parts. As such, solar generators are quiet and operate with minimal to no noise. They are simple to maintain. They also tend to have greater longevity of use and last much longer than other generators on the market. Another thing that solar generators have going for them is the fact that after they are fully charged, they will keep operating any time of day or night without you needing to do anything. During the daylight hours, electricity from the sun, transmitted through solar panels will keep the battery charged. At night, the power will charge your devices, and so forth. A fuel generator, on the other hand, runs on gas. The generator converts gasoline’s chemical energy into mechanical power, then again over to electrical energy. How does this process work? Fuel generators feature an alternator and an engine. The engine combusts the gas, propelling the alternator’s rotor, which is made from copper wire. The wire goes over magnets in the generator, and the action transmits an electrical charge. Unlike solar generators, fuel generators contain quite a few moving parts with more complex makeup. They are definitely compact and have the ability to generate large quantities of electrical charge at once to power large scale appliances and devices. They are also easy to use, as all you need to do is fill your fuel generator with gas, switch it on or pull a cord, and you’re good to go. Now that you understand the key differences between solar panels vs. fuel generators, it’s time to delve into some important pre-purchase considerations you need to bear in mind before taking the next step. The first thing you need to consider if you’re in the market for the best solar generator is the battery storage capabilities of the unit. You need a battery that is sufficient to allow you to use the generator at nighttime, when there is insufficient sunlight, and when your energy usage goes beyond the solar charge of the device. For example, a 100-amp battery typically has around 800 watt-hours of life to it. Part of this will, of course, depend on how much you intend to use your solar generator and for what purpose. Do you need to use your solar generator for camping trips or extra power in your shed? Or do you want to use it for reserve power in case of an emergency? If you’re going to be using your generator more frequently, you will need to purchase a solar generator with a higher watt-hour capacity to ensure you don’t run out of positive charge too quickly. You should also know that solar generators are not designed to power all your home’s large appliances for weeks at a time. Solar generators work best with small devices and lower-power appliances for short-term periods. A unit with a higher watt capacity could power a large machine like a refrigerator for about a day. If you want to power larger devices or portions of your home, you might need to purchase more than one solar energy unit. Another thing you should pay close attention to when purchasing a solar generator is the certifications the unit features. The certifications a solar generator has indicates the type of testing that has been performed on the machine. Certifications are conducted by the manufacturer and/or independent laboratories, so you can depend on the company’s safety measures for any given product. Finding the best solar generator to meet your needs doesn’t have to be a challenge. If you only want to power smaller devices for shorter periods, and don’t require as significant a wattage capacity, the Jackery Explorer 440, Paxcess 100-watt Portable Solar Generator, and the EF Ecoflow River Portable Power Station are all excellent choices. If you’re really interested in purchasing a portable generator with a higher charge, the Portable Power Station by Goal Zero or Portable Generator by SUAOKI might be just what you’re looking for. No matter which selection you make, each of the best solar generators reviewed are among the top in their class in terms of features, outlet options, watt-hour capacity, charging choices, and outlet options. From your next RV trip to a short-term unexpected power outage, solar generators provide a clean source of energy that is safe and easy to use. The lack of moving parts and simple solar charging of these generators make them a highly durable choice to keep your key devices charged and ready to use.